Andre "Whiteboy" Johnson, center. Photo from Rare Essence's Facebook. If you’ve ever wondered why there were relatively few R&B acts from the nation’s capital, or why Wale was the first Washington DC rapper to achieve national visibility some 30 years into hip-hop history, realize now it’s because many of the urrea’s musically-inclined were doing go-go. For the uninitiated, go-go has been the predominant sound of DC for over 50 years. You can identify go-go elements in the sonic DNA of DC-based music producers such as Rich Harrison (Beyonce’s “Crazy in Love”, Amerie’s “This One Thing”), in the Roots’ “Rising Up”, and in the occasional musical nod by DC rap pioneer Wale (“Pretty Girls”, “Clappers”). Popularized by acts like Chuck Brown and the Soul Searchers as well as Experience Unlimited in the late 1960s, the genre started as a fusion of funk, R&B, rock, and even gospel elements. In the 1980s, bands typically composed of over ten players had added elements of early hip-hop drum programming into the soundscape. By the turn of the century, a frenetic style based on bounce beats was vogue among newer bands and a younger audience. So what’s the next progression? For acts such as the legendary Rare Essence (or RE), surviving the changing dynamics of a “revitalized” DC may be achievement enough. Over the past ten years, venues throughout the area have closed as owners have been priced out, leaving dwindling opportunities for Rare Essence’s Andre Johnson—a 35-year veteran of the scene—to ply his craft. If that wasn’t enough, ordinances have popped up throughout the area that make it extremely difficult to book shows at the few spots that are left. The local radio stations—much like others throughout the country—have become top 40 monoliths, uninterested in the local grassroots scenes, and many youth have turned to hip-hop to fuel their musical ambitions. Johnson, the last original member of one of the city’s legendary acts, is trying his best to navigate a tenuous circumstance. This Friday, RE releases Turn it Up, a full-length album and rallying cry for fans and artistic peers alike. 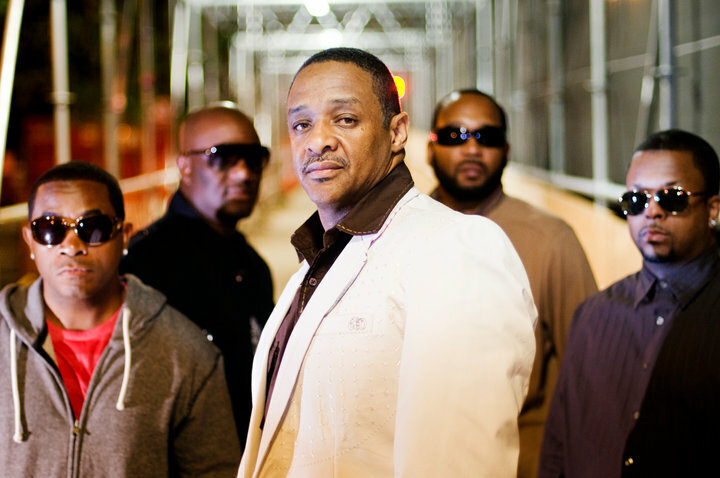 The project is full of original material, a departure from the cover songs that typified go-go music for years. I got a chance to speak with him on the phone about how gentrification and radio homogenization has affected Rare Essence, and just what could be done to salvage the scene. Let’s talk about Turn it Up. What can your fans expect and what, if any, are the major differences in the composition of this project versus past projects? This project, this is the first studio project that we’ve done in about 15 years. Go-go has a reputation for doing a lot of covers; this is an all originals project. It’s also the most ambitious. We tapped into a couple of DMV folks, but folks that have a big reputation outside of DC as well. The first single, “Turn It Up”, features DJ Kool. Everybody knows DJ Kool from “Clear My Throat”. It’s a club record. Go-go records, as soon as the record hits, you know that it’s a go-go song and Kool adds his signature hype onto the record. We also have songs that feature Raheem DeVaughn, Miss Kim, as well as Michael Muse, who was vocalist for Rare Essence years ago. Then there’s a ballad. We haven’t done a ballad in about 15 or 16 years. Talk some more about the ballad. It’s an original ballad and it was song by Casey Williams from the Black Alley Band. We recorded all of that, and we’ve structured the songs in I guess what would be a standard song format. Anybody that knows anything about go-go [knows a] song can go for 10 minutes. What we did was put these in standard song format. Five minutes is the longest song that we have on there. Every time we were to go to certain DJs and certain program directors from radio stations outside of, say, Richmond, they want an edited version of the song, they don’t want a live record. We understand why they want that, it’s just that isn’t how we’ve been doing it for years. But that’s how we did it on this record here. Aside from the concerns with the DJ’s, what were some of the primary motivations for going this route with the project, as far as original composition? Mainly because we feel like go-go has been silenced in DC, which is the reason for the title song on it, “Turn It Up”, we’re saying turn this sound up. This is good sound. We want everybody to hear what it is we’re doing. We’ve been mainly promoting DC, Maryland, Virginia and the Carolinas. We don’t really go too far outside of there, or we haven’t in the last 15 years. With this one here, we’re trying to go all across the country and across the world if possible. Which is the reason we’re back into doing music videos now. The first song, “Turn It Up”, that features DJ Kool, we have a video for that, that we sent to BET, MTV, VH1 and all the other major video outlets. This whole project is designed to try to push the sound outside of DC as well as revitalize the sound inside of DC because there aren’t a lot of go-go records that are on radio here now. You mentioned that you feel like go-go music has been silenced in the DC area. What do you think are some of the primary factors that contribute to that silencing? I think one of the main things is the music business has changed. The ways people promote their records, the way the major labels all promote their records, are a lot different from when it was 15-20 years ago. Back then, it was nothing to hear two or three or four go-go records in rotation on a daily basis. Now, you’re lucky if you get a record or a go-go mix, because that’s what they’ll do, they’ll have a mix show where they’ll do an all go-go set. One station here, WKYS, they do a “crank session,” a half hour of go-go every night from 9:30 to 10, but a lot of that is live V8 tapes and stuff like that. Gentrification is something that’s changing the dynamic of major cities and suppressing local cultures. What are some of the biggest effects that you’ve experienced as an artist? The closing of venues is what has been a major factor in the music being silenced. Where years ago, we may have had 30-35 venues just in DC alone to play, right now we’re lucky if we have ten. That has a huge effect on the ability for the bands to work and be heard, because if you go from 30 venues to seven or eight, then you’re not getting the different parts of town. A lot of people just want to stay in their neighborhood. We’re not able to get to the neighborhood because the clubs have been closed down and turned into condos or whatever. That has been affecting the music as well. When you say about ten, is that within the limits of DC or the entire DC/Northern Virginia/Maryland area? It’s all around. DC is where you see it the most because DC is changing on a daily basis … [but[ Maryland is putting a bunch of stipulations on what club owners can do, what type of music club owners can play. They don’t want any of the bands to play live out there in Maryland and they also are closing down, but they don’t want the DJs to play live music … [and] that makes it harder for the bands to be able to make a living. Definitely. When did those stipulations come into place? The one in PG County started somewhere around 2011. They passed this law that says that the club owners have to be responsible for the show. They won’t let the promoters rent the club or hire the bands to promote; they want the club owner to be liable for [everything]. I’m not sure what the reasons are, but we deal with a lot of promoters, there are a lot of entertainment promoters around in this area and they would be the ones to contract the club and then hire the band to play that club. Now, I think what has to happen is the club owner has to do the presentation, they have to do the shows themselves and a lot of club owners are not promoters; they just want to run the club, not promote a band in the club. When did you begin to see the tide really start to change as far as the amount of venues dwindling in the area? Was there one particular venue or event that really put the writing on the wall? This has been going on slowly for decades. Just in maybe ten years, we’ve seen it really, really decrease, the amount of venues that we’re able to play. Especially in DC, because that’s where a lot of the clubs were closed and different condos or office buildings or whatever would go up. With the city changing like it is, it’s increasingly harder for us to find a venue to play at. The venues were larger back then [could] maybe hold 600-700 people in one place; now we’re forced into a place that may hold 200 people. That makes it harder for everybody to survive because most go-go bands are nine, ten people. It’s hard to be able to make a living off of 200 people without charging an arm and a leg. If you’re charging everybody $40 or $50, there’s some money there to pay the band and security. … If you can only charge $15 or $20 dollars, it doesn’t go a long way. I feel like along with gentrification and venues being priced out, another thing that is potentially affecting the go-go scene seems to be the lack of youth involved in it. My brothers, they’re 19 and 16. When I come back and I talk to them they’ve said they feel like kids their age were more into hip-hop than go-go. Do you have the same sense? I think it’s because that’s what they hear on the radio a lot. They hear it on the radio and with the internet and YouTube being the dominant force that it is, that’s where most kids get their music from. Where they used to hear a lot of go-go on the radio, they don’t hear that anymore. Also, as far as the youth go, how much do you think the education system, the lack of music programs in these schools has to do with it? As far as kids not even knowing how to play instruments? That’s definitely a factor in the live aspect of this whole thing, because I know that a lot of the kids that were in school, taking music in school, they were particularly interested in live music. They would see the band, and they would try and imitate those bands, now they don’t have an outlet for it. It makes it a lot harder to be able to recruit and to have the kids to be a part of the music scene. What are some realistic things that you envision that can be done to keep the scene at the level it’s at for now or attempt to revitalize the feeling of the Go-go scene? The one thing we need to revitalize the scene is the increased support from local media. We need those things to help let people know that the music is still out here. You can purchase the music on iTunes, Amazon, or wherever and you can go see the band at this place or that place. If you don’t know what they sound like, here’s their new record. If we had all of that to help, that would help to keep people’s interest in the music.